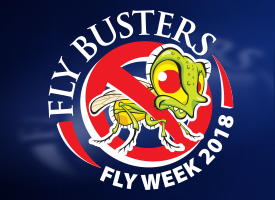 Livestock Fly Week 2018 is July 30th - August 5th! Watch for deals and informational items all week! Starting on August 1st at 10 AM CDT! Buy 6, Get 2 Free! Must add 6 to cart. Rescue! TrapStik uses new VisiLure technology to lure flies with appealing colors & multi-dimensional patterns. They are attracted to the TrapStik, then get stuck to the adhesive surface & expire on their own.